In school, kids have to take tests to see how well they are learning the material being taught. If they don’t pass the tests, they will be held back instead of advancing to the next grade because they can’t move forward without sufficient knowledge to absorb new material. It is one thing for kids to pray and accept Jesus as their personal Savior, becoming “saved”. It’s another thing for them to know what grace is and that it is the grace of God that saved them. Kids and teens today often have a surface understanding of the Gospel. They will say they are saved because Jesus died for them. But do they truly know what Jesus went through to die for them? Are they really appreciative of the gift Jesus gave us so they have freedom in Christ vs. just having a fire insurance policy to get to heaven? Every parent has the responsibility to help their children grow up in their faith so that when they leave your home they can live for Christ maturely on their own. Here are 12 Ways to help you evaluate basic areas of spiritual growth, taking into consideration what is appropriate for the ages of your kids. These are good to think through at least yearly to evaluate their spiritual growth. Do they obey God’s principles of right and wrong?? Do they know how to lead someone to faith in Jesus Christ? Do they know what Scripture they would share? Do they have these verses memorized? (Bill Bright, the founder of Campus Crusade for Christ wrote the “4 Spiritual Laws” for this purpose. It is good to carry this little pamphlet in your wallet to have handy when you need it. Do they know how to disciple someone, teaching Spiritual truths? Do they know how to lead a small group Bible Study? Do they consider the preciousness of others putting their needs first? Do they have a daily quiet time, do they read the Bible and talk to God? Do they know the books of the Bible? Can they find the books of the Bible without the index? Do they have favorite verses in the Bible? What are they? Do they memorize Bible verses? Do they know how to pray conversationally? Are they familiar with other religions and how their teachings contradict Christianity? Does their belief in God show in their words and actions? Do they look forward to going to church each week? Do they listen well to the sermon, taking notes? Do they come up with ways to apply what they learned? Are they blessed when they worship God in song or do they just sing along, looking around thinking about other things? Do they have a servant’s heart? Please remember – these are goals you are working towards as you disciple your children in the Spiritual truths of God’s Word every day of their lives in your words and actions. 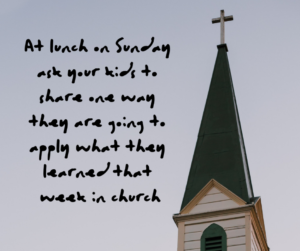 Are your kids “growing in the grace and knowledge of our Lord and Savior Jesus Christ,” their focus being on becoming holy rather than focusing on being happy? Are you?